Only top 25 teams between MBA schools around the globe were selected for the semi-final/final round of the Leeds Net Impact Case Competition, that took place in Leeds School of Business in Colorado, USA, and we are happy to announce that IE team was one of them. After a tough competition our team was recognized as the best non-American team in the competition. Congratulations to the team members Alexandra Oborina, Jan-Philipp Gehrmann, Sarit Ventura and Marius Meissner for this amazing result!!! To start off with a couple of sentences to the NICC competition: The Leeds Net Impact Case Competition (NICC) is the premiere MBA competition focused on solving real world sustainability business cases. NICC attracts top-rated business schools and future industry leaders to solve a case first virtually, providing a narrated ppt presentation within a short time (6 days). In this first round 56 groups have participated. The jury then invited the top 25 to join the semi-finals which took place in Boulder, Colorado. These 25 groups were divided in 5 groups of 5 teams whereof the best teams of each group reached the finals. The IE team which consisted of Alexandra Oborina, Marius Meissner, Jan Philipp Gehrmann and Sarit Ventura (all Global MBA, intake November 2013) ranked second in our group of 5 and thus, nearly missed the finals. However, the IE team was the best non-American team and awarded by the jury for its impressive and thorough presentation skills. The first three ranks were taken by impressive business schools such as Berkley, MIT Sloan and Leeds Business Schools which shows that the level of competition was very high. Overall, we are very happy with our results and would always do it again! 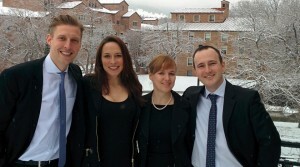 All 4 members are from the GMBA core group. By the time we decided to register for the competition each one of us was already 4 months in different modules. This nicely shows the strong bonds we built during our core period and is an advertisement for the Blended squared concept. The preparation for the first round happened completely remote from Munich, Hamburg, Zurich and Niche. We did everything in the evenings live with video conferences. All other teams were doing F2F MBAs and worked on their presentation locally together. It shows that a proper team working remotely together can be just as efficient and successfull. Once we made it to the finals all of us were immediately committed to go to the finals, although it was just 3 weeks before final graduation. I (we) can only recommend to go for such case competitions. The experience you gather locally by meeting new people from all around the world, expanding your network and by presenting your pitch in front of critical judges is great. We all learned a lot. And of course, we also celebrated once the work was done. 3 of us extended the stay by 1,5 days and went to the rockys where we tested our skiing skills on the vail slopes. Another unforgettable experience (Sarit, do you have a nice group foto on that as well). And last but not least thanks to the IE who supported us on this trip.